As per latest data from RBI, there are 22 crore RuPay cards in usage in India as of now, which is growing at an incredible pace. Considering that the first card was issued in March, 2012, RuPay has already captured 35% of the market in India. Such exponential growth of RuPay Cards has clearly threatened existing players in this niche: Visa and Master Card. They have now accused the Government of using their influence and reach to kill competition. In other words, it the monopoly of Govt. backed RuPay cards which they are complaining, as demand of level playing field increases. 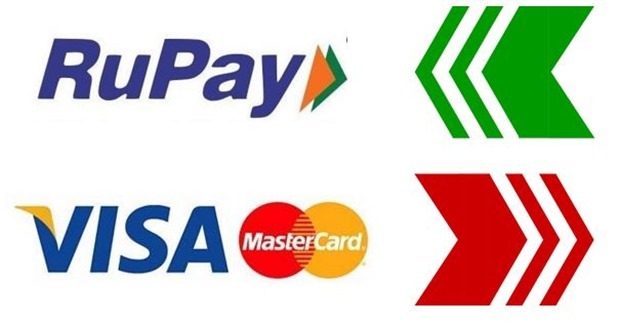 In strongly worded statements, both Master Card and Visa have directly accused the Government of using their influence, reach and power to increase the spread of RuPay card, as they are becoming helpless to compete against such a force. By lowering transaction fees by 30%, by issuing an unspoken ‘mandate’ to all banks regarding spread of RuPay cards, they are losing out in the fight. And it’s the monopoly which they are afraid of, more than the competition. On the other hand, Visa has requested that considering the fairness of the market, there should be a level playing field for both Government and private enterprises to survive and work. On their defense, Visa said that their pricing structure is lower than RuPay on some counts, but due to this ‘mandate’ from the Government, more RuPay cards are being issued than it would have been naturally. They ask, when all banks are asked to issue only RuPay cards, how will they fight? Master Card has 180 million debit and credit card holders in India, which allows them a share of 28% in the Indian market. But within 3 odd years, RuPay has grabbed 35% with 222 million cards, and this is clearly irking them. We had earlier shared three reasons why RuPay cards may end the monopoly of Visa and Master Card in this domain; but the accusations of Visa and Master Card regarding Government sponsored monopoly and ‘unspoken mandate’ is clearly a serious charge. No business environment can thrive on such state sponsored diktats, and it is clearly against the free nature of the market and business ethics. We will observe how Government and RBI respond to these allegations, and accusations. And we will checkout how Visa and Master Card plan out their survival in India. "Visa, Master Card Threatened by Meteoric Growth of Rupay Cards; Accuse Govt. of Monopoly", 5 out of 5 based on 4 ratings. Confirmed! Reliance Jio 4G Services To Officially Launch on Dec 27th!